Keeping your pet dog hydrated is a must. If you find it difficult to do so, then we have a solution for you. What you need is a dog water fountain. Your dog would also prefer drinking from running sources of water. Dog water fountains provide your dog with healthy and safe drinking water. They have various useful features; one of which is the flowing stream of fresh water all day in a waterfall or circular motion. Generally, the top-rated dog water fountains have the filters; one for removing debris and other for removing chemicals like carbon. However, finding the best dog water fountain can be a bit confusing. It all depends on your preference and features you are looking for. Some might prefer an indoor water fountain while others want an outdoor fountain for their dog. But you don’t need to worry! To make it easy for you to choose, we have listed and reviewed the best dog water fountains in this article. 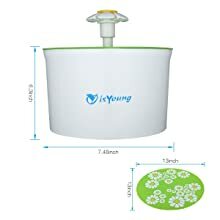 The water fountain material is the first thing you need to look when buying a dog water fountain. They come in many designs and style made from stainless steel, plastic, glass, and ceramic. Plastic ones are affordable but look for those made from BPA-free. If you intend to keep the steel or ceramic one outside, so make sure that is corrosion free. The next important thing is the filtration system in the fountain which is the main factor in providing clean water. Most fountains come with carbon/charcoal and foam filters to absorb dirt, debris, hair, and other particles. The carbon filters also give good taste to the water. Look for activated charcoal filters that have amazing absorbing properties and also attract numerous pollutants from the water. The replaceable filters of water fountain must be changed after the desired time for the proper filtration results. A dog drinks approximately 0.5 to 1 ounce of water per pound of body weight daily. So, look for those fountains that have higher water capacities (<50 ounces) if you have a larger dog or multiple dogs. 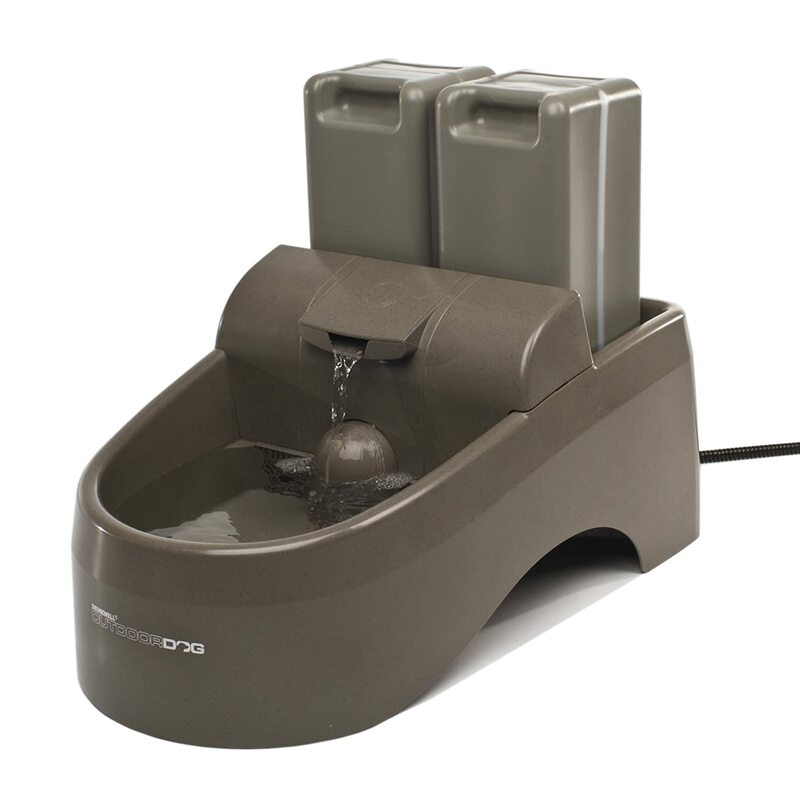 A large water capacity dog fountain will save the hassle of refilling it again and again. Some dogs might prefer a medium flow of water while drinking while others may like the free-falling high stream of water. It all depends on your dog’s preference. So, it’s better to look for a dog water fountain that has adjustable and different water flow settings. A dog water fountain is a great way to keep your dog hydrated. 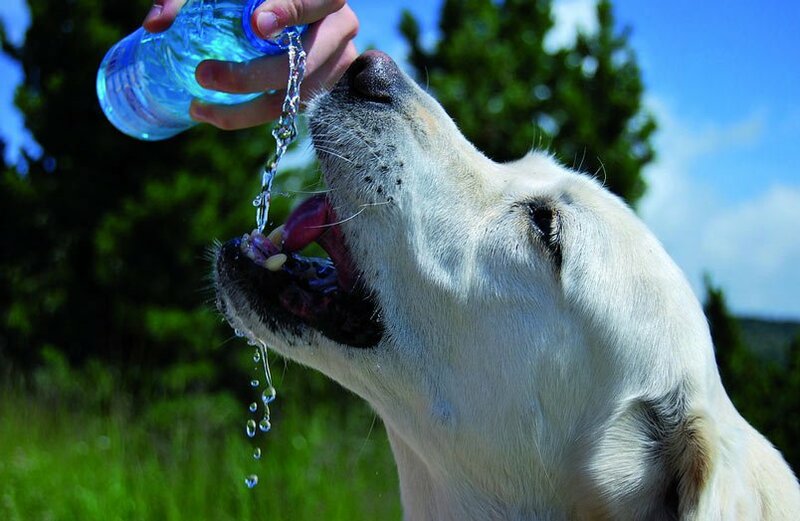 A dog will remain healthy if properly hydrated preventing liver, kidney and urinary diseases. It provides them with clean water that is free from bacteria and chemicals than the toxic water from ordinary taps or faucets. The filters in the fountain also retain the taste of water. A water fountain makes sure that the water provided to your dog is safe, clean and rich in oxygen which is essential for healthy functioning. This water fountain by PetSafe provides your dog with a continuous supply of fresh water holding 128 oz. Furthermore, it has one activated carbon and one foam filter. Your dog will stay healthy and hydrated as dual filtration feature removes taste, bacteria, and odor from the falling water. It provides your pet with filtered water and encourages your dog to drink more water and stay hydrated. Your dog will be safe from kidney or urinary diseases when fully hydrated. Not only that, but the free-flowing water streams put in freshness to the water by adding more oxygen. The brand guarantees to have 50% more activated carbon in their filter than other water fountains in the market. Above all, you will find it very easy to clean with the cleaning kit included and can dissemble in a few seconds. In addition to this, the top-shelf is totally safe to clean in a dishwasher. The product dimensions are 7.5 x 14.8 x 14.6 inches and weighing just 4.47 pounds. The pump won’t create any noise as it is designed to operate quietly. We highly recommend this pet water fountain for your dog and your cat too. 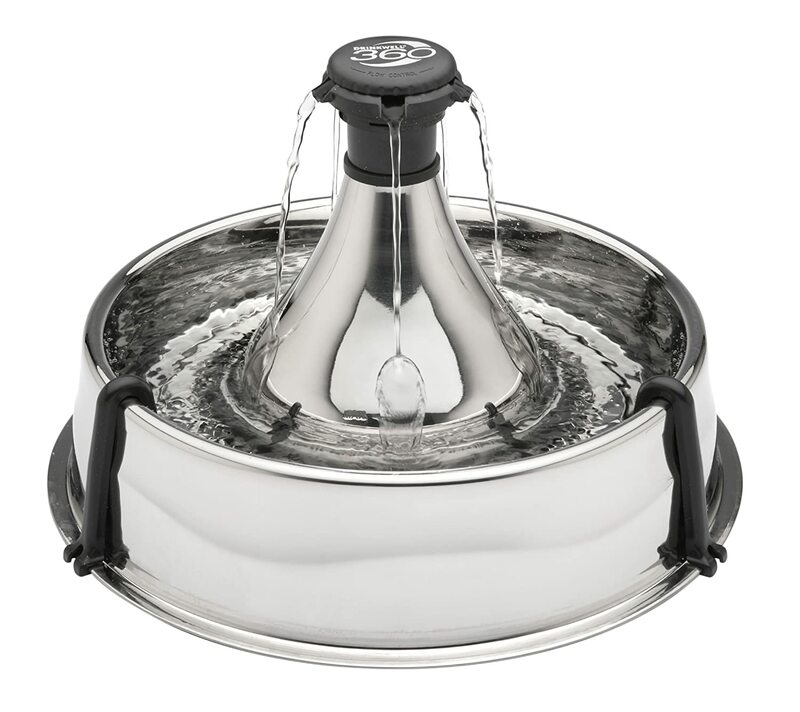 Another dog fountain by PetSafe that is ideal for both indoor and outdoor use. It holds a high water capacity up to 450 oz that is an excellent thing if you have more than one pet. Holding 3.5 gallons of water makes it the highest water capacity dog fountain. The product dimensions are 21 x 14.1 x 12.5 inches while it weighs 8.5 pounds. 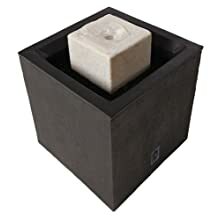 This fountain is made with plastic that is UV- resistant for placing it inside or outside the house. Furthermore, the water refilling is easier with the help of dual reservoirs. It also comes with dual filters; one of foam and the other 3 layers carbon filter to keep water pure and free from impurities, odor, as well as other particles. 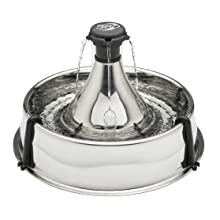 All in all, this free-falling large dog water stream fountain is recommended for your dog’s hydration. Looking for a cute indoor dog water fountain? The answer is the isYoung’s attractive water fountain that holds 56 ounces of water. The product dimensions are 7.4 x 4.9 x 8.5 inches while the weight is just 1.8 pounds. It provides clean and fresh drinking water at an area of 360 ̊that is ideal for all little pets’ even birds. Moreover, this cute looking fountain has 3 different water flowing settings. As a result, one is the faucet like a stream of a flower waterfall, other with bubble flowing water surface and waterfall. 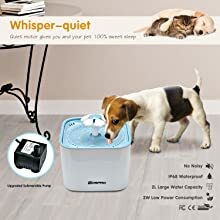 What’s best about this fountain is that it is ultra silent; the motor is very quiet and won’t disturb your dog’s sleep. Large water capacity of 56 oz. This water fountain provides your dog with a fresh stream of pure water. It has a very high water capacity i.e. 88 ounces. The product dimensions are 10 x 10 x 10 inches while the weight 2.5 pounds only. The steady circulation of water inhibits the growth of bacteria. As a result, water will remain free of chemicals and particles as it is equipped with a replaceable carbon filter that absorbs all impurities. The top-shelf is made of plastic that is BPA-free and dishwasher safe. 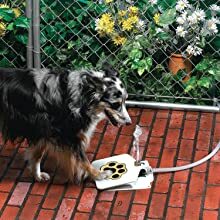 In addition, you won’t hear any water splashes sound or spills with this low decibel dog fountain. 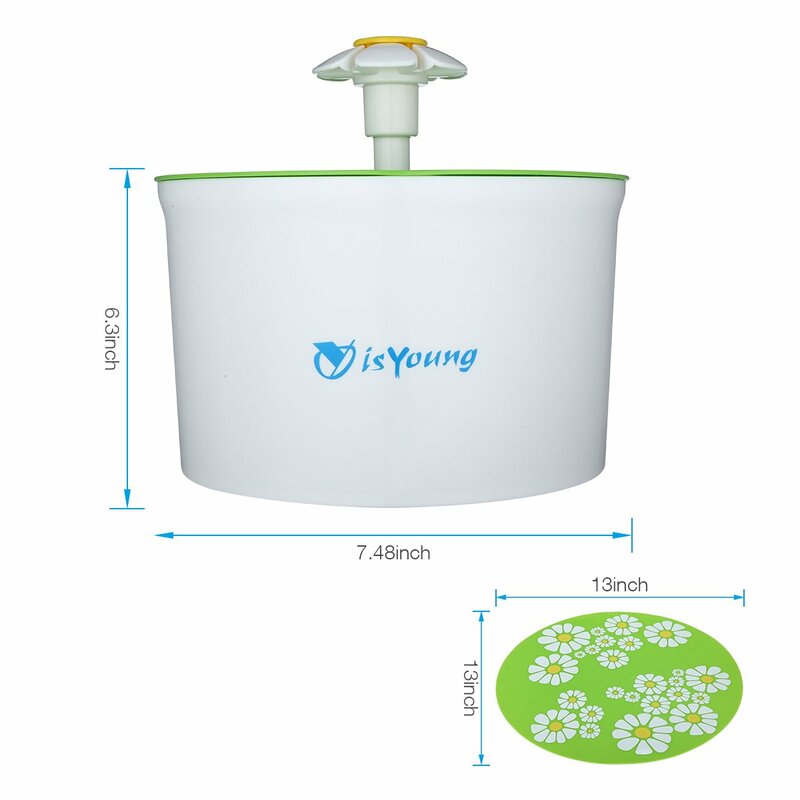 Overall, this high capacity dog water fountain is very much recommended to keep your dog hydrated with clean water. 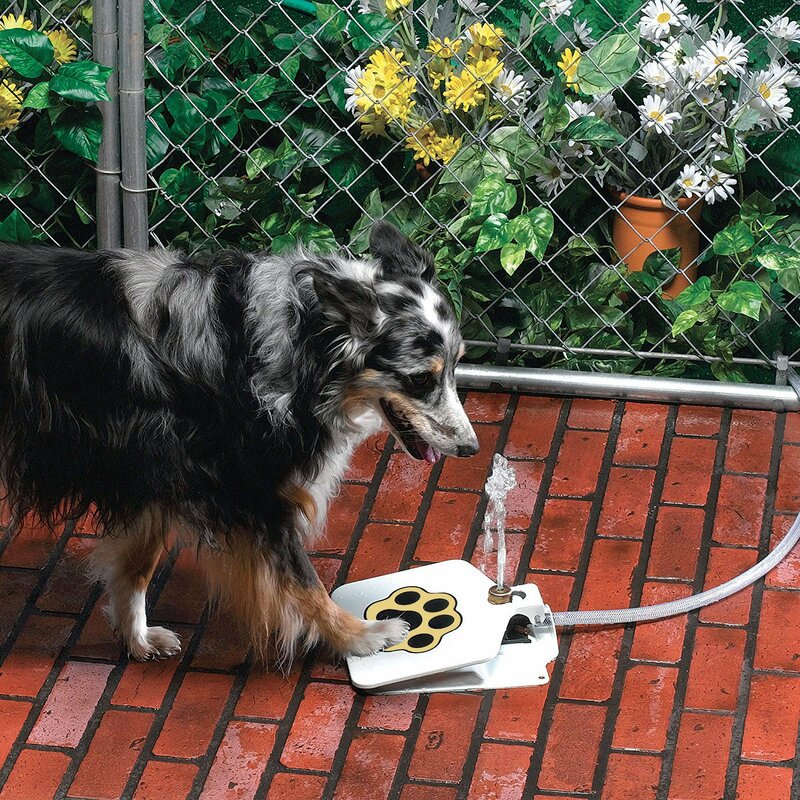 This is the best outdoor dog water fountain that holds a high water capacity of 338 ounces. The product dimensions are 12 x 14.3 x 10.3 inches while the weight is 14.3 pounds. Moreover, having an elevated design, it provides an easy raised position to your large dog to drink water comfortably. Furthermore, it is equipped with a re-circulating feature which aerates and cools the water. No stagnant or stale water! 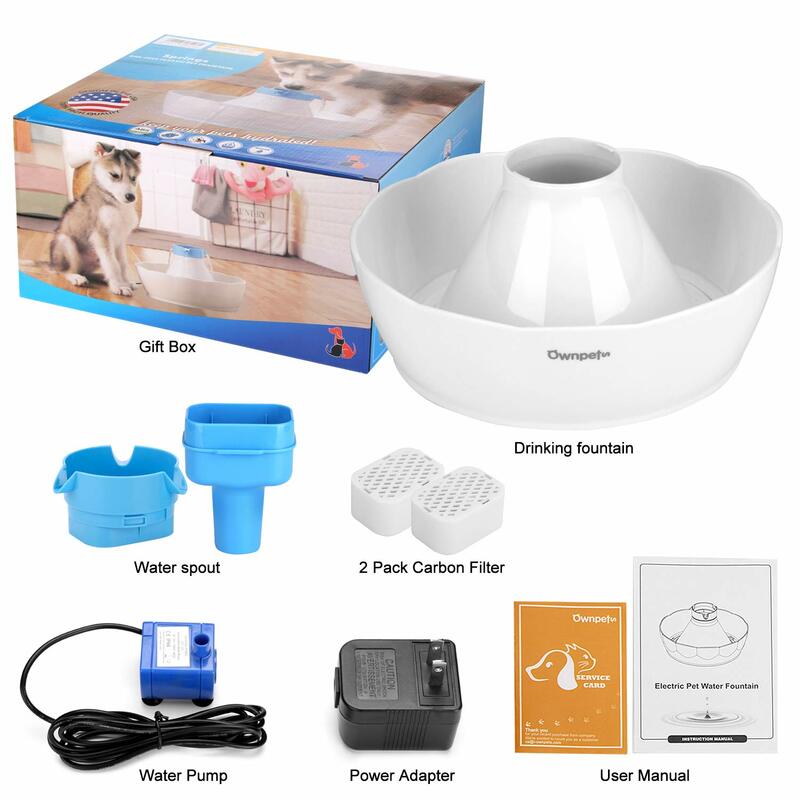 It also has multi-filtration property providing your pet with pure water. The best feature this fountain has the energy efficient LED light that glows in the dark. This consequently grants your dog better night-time visibility. This attractive large water fountain holds up to 2L of water. It is equipped with a multi-filtration feature which, as a result, provides a continuous flow of clean and fresh water for your dog. The product dimensions are 7.2 x 7.2 x 4.7 inches while it weighs 1.7 pounds. Moreover, the recirculation system and multi-stage filtration keep water fresh. The premium charcoal filter removes hair, debris and dirt, bad odor as well as taste from the water. No noise, the motor is very quiet. Also, it is IP68 waterproof and comes with 3 different water flowing settings. 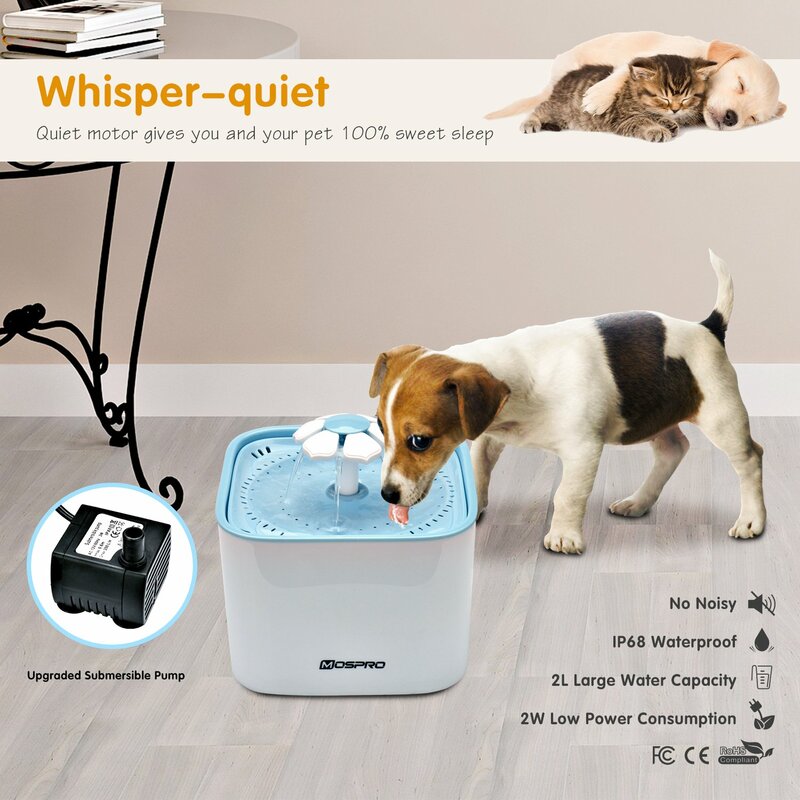 To sum it up, this automatic pet water fountain is very environment-friendly as it is made from a food-grade imported resin material that is BPA-free. The Unilife fountain is ideal for smal, medium sized dogs or cats and holds waters up to 1.8 liters. It has a waterfall design with double lining anti slid exterior. The product dimensions are 9.8 x 7.6 x 4.3 inches while it weighs 1.7 pounds. In addition, the flow control is adjustable to increase or decrease water flow. This water fountain provides clean and fresh water that is free from impurities and dust as it has charcoal and foam filters. Your pet easily sees this drinking fountain in dark because of the blue LED light feature. 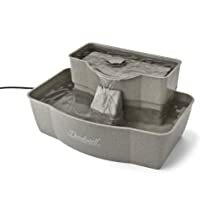 This is a high water capacity dog fountain that can hold up to 100 oz of water. It provides your dog with a convenient supply of clean, fresh and filtered water. 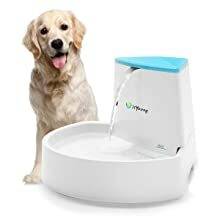 All sizes of dogs can enjoy drinking from this fountain as it also comes with an elevated drinking dish and a lower drinking bowl. It is also beneficial for dogs that are suffering from arthritis. Apart from this, the carbon filters made from coconut shells are replaceable and removes the bad odor and taste from the water. Additionally, the water flow can be adjusted with a flow control option. This water fountain is BPA- free while the top-shelf is safe to wash in a dishwasher. So, all in all, we highly recommend this water fountain for your dog. This unique style water fountain is something that you have not seen anywhere. It is a step on water fountain which allows your pet to drink water by themselves. So, all your pet needs to do is press the pad to release the water from steel gauge. Furthermore, the steel gauge makes it strong and durable. It comes with a copper valve that is leak proof and friction pads made of rubber preventing leakage. Don’t worry, it is extremely easy to install as well. Just connect the 42″ hose with the tap or faucet and set the water flow and pressure. It’s your choice to install indoors or outdoors. The product dimensions are 3.8 x 12 x 10.5 inches while the weight only 3.57 pounds. When your dog steps on the paw designed pedal, a narrow freshwater stream activates for drinking. This drinking fountain has the ability to hold 0.8 gallons of water for your pet to drink. The free-falling water stream provides fresh and clean water 24/7. Furthermore, it has 2 areas for drinking; upper for large dogs and down area for smaller dogs. The water will free from particles, chemicals, and impurities as it has dual filters; one sponge filter that absorbs all hair and debris while the carbon filter removes bacteria, bad smell, and taste to provide fresh oxygen-rich water. No water storage! You will be free from frequent refilling of water as it lasts more than 30 days. The pump is very silent and won’t disturb anyone’s sleep. 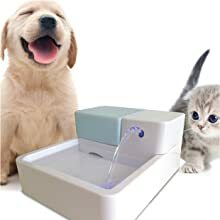 So, if you are a dog owner then buying a water fountain is a necessity for you. 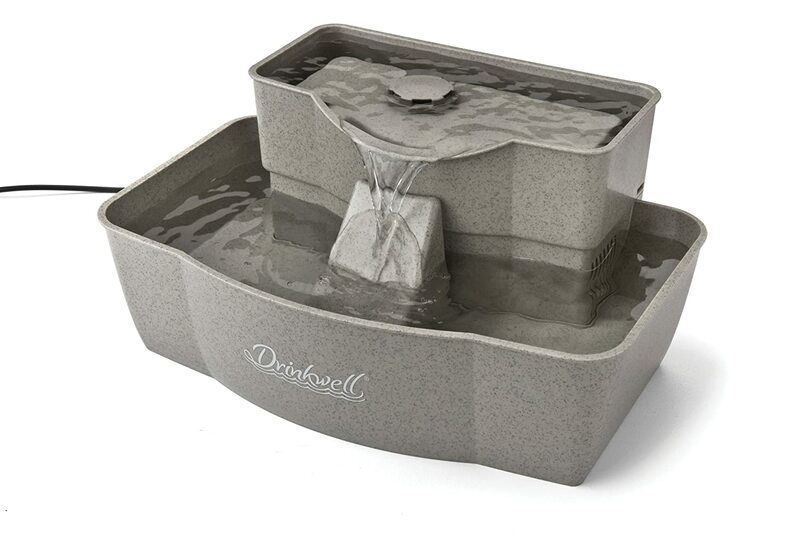 However, our top pick is the PetSafe Drinkwell Indoor/Outdoor Dog Fountain which is ideal for both indoor and outdoor use. 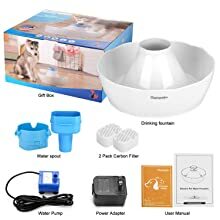 It comes with two filters and holds a high water capacity that is an excellent fountain for multiple dogs. Being resistant to rain and sunlight and having an elevated drinking bowl, it is the best outdoor dog fountain that is ideal for every dog size. So don’t waste any time because your dog’s health is important.